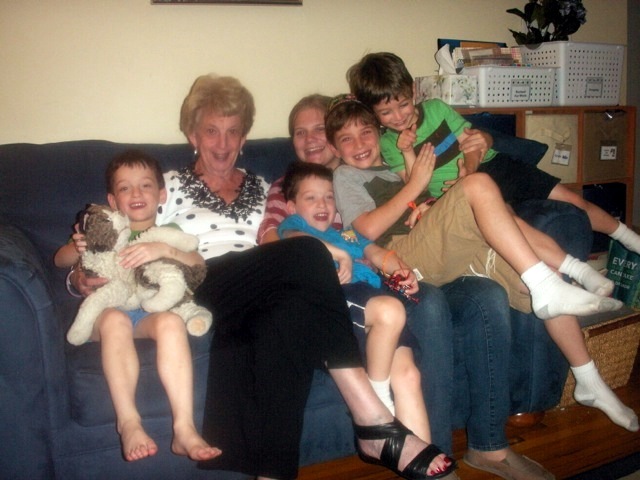 For weeks I had been trying to figure out what to do for my triplets’ 5th birthday party. I wanted to make it special for them and perhaps have it outside the house. We have always done their parties at home or at one of my best friends’ houses. However, after calling around and getting prices, I realized that having the party somewhere else was not going to be financially feasible. Even reserving a park pavilion was a minimum of $50! So home it was. I then went online to get some ideas for what to do. How did we ever plan parties before Family Fun magazine and Pinterest!? My boys kept changing their minds as to what theme they wanted and I couldn’t really get agreement between them. However, I knew that were currently enjoying playing anything superhero-related. So I figured they would enjoy anything I planned that involved this. I found so many great ideas and found some amazing people out there who are extremely creative (and have much more time than I do). I made a trip to Michaels’ for supplies and then set to work. My supply list included: t-shirts (These were on sale for $3, but still my most expensive item. However, considering we weren’t doing other party favors, that was fine. ), felt, felt glue, icing, fabric paint, foam brushes, and blank stencils. I already had elastic and glow bracelets at home. My first project was to make masks for the kids. I had wanted it to be something they could make on their own, but decorated masks didn’t seem to fit with how superheroes look. Plus, plastic (which would be the easiest to decorate) is also the easiest to break, which we found out last Purim. 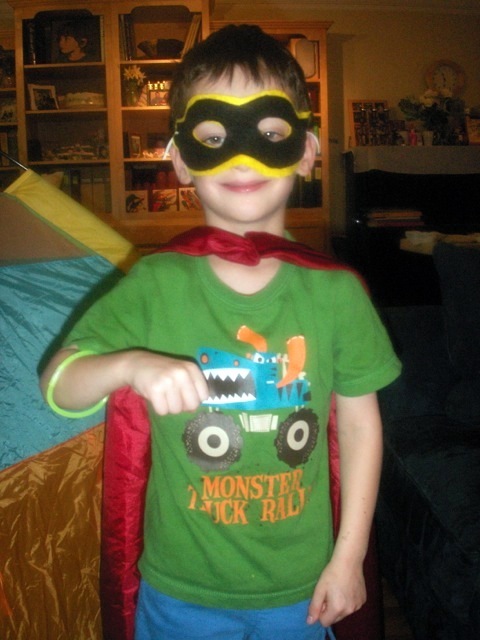 One of my boys with his new mask and his cape (Chanukah gift last year). 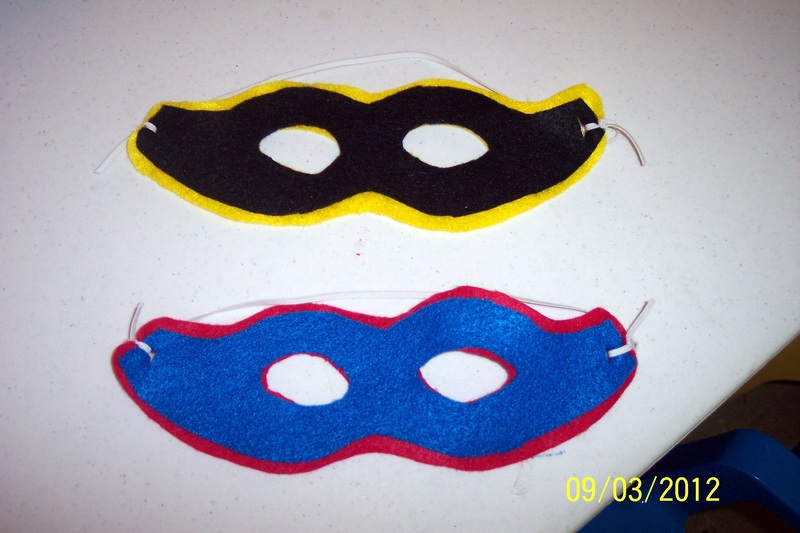 Instead, online I found a cute idea for making felt masks. I traced, cut, and glued with felt glue to make these double-layered masks. The instructions say to sew them, but I do not have a sewing machine and hand stitches would have taken forever! I tied my boys’ masks that morning to make sure they fit right and then did the guests’ as they arrived. The boys had fun wearing them and climbing in our tent pretending to be superheroes. For crafts, I had coloring pages out on the table when they arrived. There are tons of websites offering free coloring pages on any topic you can imagine. Thanks Lori for this great idea! 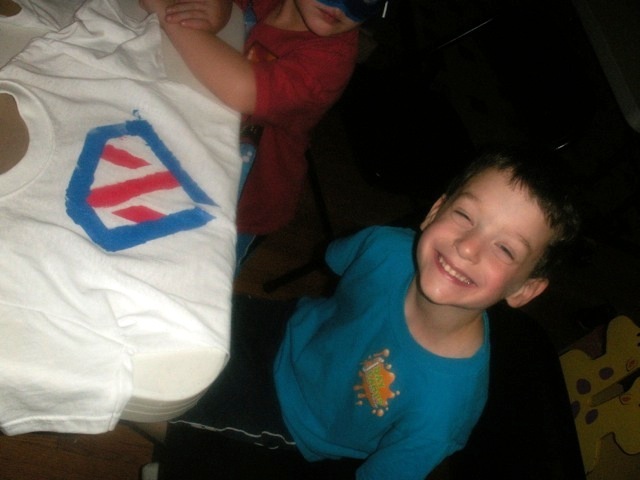 For the main craft project, I thought it would be nice to have the kids make their own superhero shirts. I bought blank stencils and my husband drew out the diamond-shaped background and then the first letter of each child’s name. (We had three diamond-shaped stencils for everyone to share and then each child got their own letter = 2 steps.) I then traced these on the stencils and cut them out. This was no easy task – who knew making a stencil to have the paint go in the right place would be so hard! Luckily Brent found some stencil letters online to use as a guide, but drawing them was quite tedious! 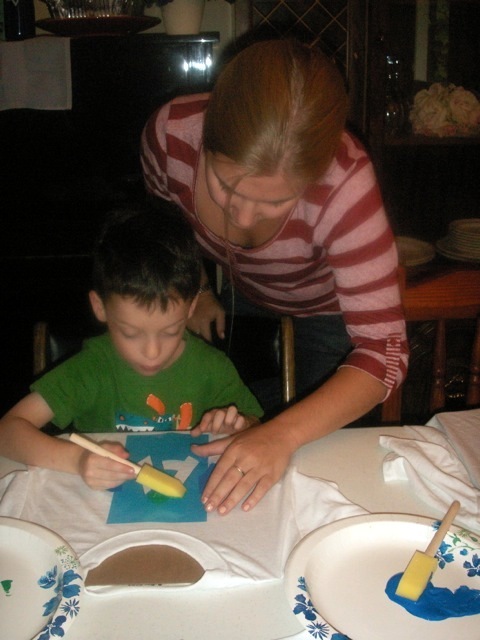 The kids then used them with fabric paint and foam brushes to create their superhero emblem. Luckily, my smart sister reminded me to put cardboard between the shirt’s front and back before we started painting! (Thank goodness for all my leftover Creative Memories cardboard from their packages.) We also decided to dry the paint a bit with a hair dryer in between the two steps, just to deter any smearing. The kids and moms had a great time and they came out great, if I do say so! For our other activity, we wanted to do an obstacle course outside. However, it rained the night before and was very humid. So on to plan B. My older son and I created a spider web in the kids’ bedroom. The object was to climb through the web to the windowsill, where the kids would find a prize (a glow bracelet). They then had to find their way back, going a different direction. The boys loved it! We ended up doing this activity while my sister and aunt dried the first paint layer on the shirts. After we finished the shirts, it was lunch of hot dogs, beans, corn, pickles, chips, and cupcakes. We had decorated the cupcakes with plain vanilla icing and then drew on shields with each of the birthday boys’ initials (with decorating icing). Thanks Michelle and Brent (daddy) for collaborating on this. We did have to buy food and the craft supplies, but overall our costs were low. The boys said they had a great time and slept well that afternoon! Not fancy, but it worked out and was fun! 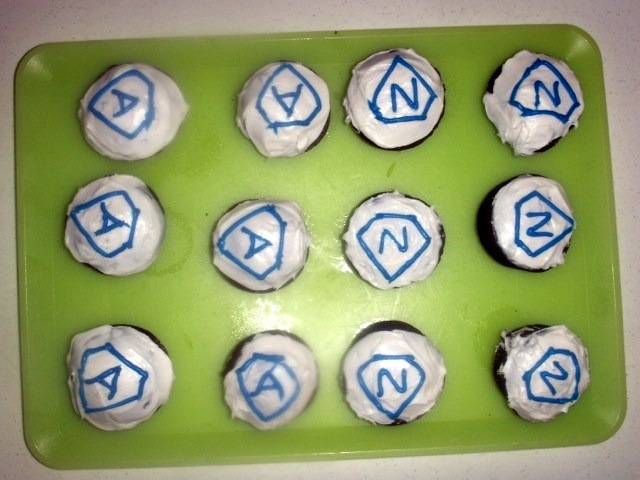 We are so grateful to our friend, Michelle, who helped decorate the cupcakes and took pictures, and to my sister, Amy, and my aunt, JoAnn, who helped at the party! Looks like fun! We did a superhero Purim last year – all DIY. Pinterest is a goldmine for this kind of thing!